What does an Ikea showroom, donkey sanctuary, and the Thien Mu Pagoda sacred grounds all have in common? Each set the scene for a poem representing Canada. 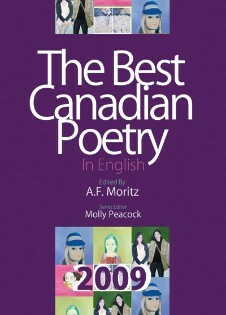 They are also a mere sampling of the fifty best poems selected by editors of The Best Canadian Poetry in English 2009. For the second annual edition, the task of selecting poetry to represent the best of the best belongs to guest editor A. F. Moritz. His own poetry has received awards from the American Academy and Institute of Arts and Letters, Canada Council for the Arts, and the Guggenheim Foundation. But what defines the best? And what makes Canadian poetry Canadian? In the anthology’s introduction, Moritz writes, “Today’s Canadian poetry is an adventure undertaken with brio. Its clarity and surge are evident equally whether its mood is dark or light, its page meditative or militant.” This statement comes after Moritz’s task of reading fifty-four journals throughout the year. In his search, Moritz created a longlist of one hundred poems before selecting the final fifty. The sun is indeed shining on Canadian poetry. In a collection that surfaces the best poems from journals such as Nova Scotia’s The Dalhousie Review and British Columbia’s The Capilano Review, Canadian poetry is defined and represented with as much diversity as the landscape itself. As a cultural melting pot, international influence is evident in poems such as Changming Yung’s “Chinese Chimes: Nine Detours of the Yellow River” and John Reibetanz’s “To Darwin in Chile, 1835.” Such is the beauty of Canada; it is what it is because of its people and its permeation of worldly flavors. The Best Canadian Poetry not only defines “the best,” it also helps define what it is to be a poet in Canada. From sharp-tongued opinions to gentle, healing comforts, these poems exhibit an entire landscape of emotions, triumphs, and artistry. Whether drawing us in to a tumultuous “dream among the firs and hills” in Adam Getty’s “Pender Harbour,” or taunting us with the eerie secrets of Margaret Atwood’s “Ice Palace,” the best Canadian poems of 2009 evoke more than a sense of place; they are a catalyst for discovering a nation. Perhaps, then, it is best to begin reading this collection with Peter Dale Scott’s “Breathing Exercise: A How-To Poem.” As the speaker suggests, “when you shrink your mind / it is enormous // the whole length / of human history / can be fit inside it.” So, too, can the palette of Canadian poetry best be consumed: in focused bites, with big, full, flavor on each and every page of this satisfying anthology.